Having just moved my rather sizable whiskey and wine collection (200+ total bottles) – I have a better idea now how to do this compared to just a few weeks ago and in my “I’m back to blogging and getting back to life” post (really titled “Spring Cleaning” click HERE) I was asked by Chuck over at the Whiskey World Tour blog if I had any tips for moving one’s collection. Turns out, I do! Too many to write in the comments section so I thought it best to list them here. Not assuming we’re all starting out with the same base knowledge about this – some of these tips may seem obvious but better to be safe then sorry! Buy a box (or 2, 3, …) of the 1 gallon size Ziplock bags for your shorter bottles and the 2 gallon size for your taller bottles (I personally like these: Ziploc Double Zipper Freezer Bag and these: Ziploc Resealable 2 Gallon Size) for all of your open bottles. You can do this for all of your closed bottles too if you’d like for just a little extra security. Place all of your open bottles in the appropriate size Ziploc bag (ok to turn the bag – not the open bottle – sideways to get the fit nice & snug (see photos)). Buy the appropriate number and size packing boxes from either The Spirited Shipper or a similar company. These are specially designed for precious – but heavy – alcohol bottles and I think they are GREAT. Before sealing the box entirely, move it around a bit. If you feel like the bottles are not completely secure or you hear them moving around (even if they are “just” hitting the cardboard sides) add packing peanuts, bubble wrap, or rolled up socks -clean preferably. If you see a good amount of space between bottles, you might be able to fit in some of your smaller, 50ml UNopened bottles here if they are well protected and don’t interfere with the packaging around the bigger bottles. One final tip – using a big bold marker, number all of your boxes and keep a list for yourself (perhaps you will organize it like: “Kitchen – 30 boxes OR: Whiskey- 5 boxes). You don’t want to run the risk of having anything accidentally left on the truck! Instead of purchasing new boxes, ask your local liquor & wine shop if you can grab some boxes after their next delivery. Make sure you inspect the cardboard thoroughly and don’t use any that feel at all flimsy or unstable. Also take a look at the inserts – grab as many as you can (if you can’t use them on your spirits, perhaps they’ll come in handy for your dishes or something else). Assuming your whisky collection has bottles of various sizes, you’ll need to spend some time making sure you package all of the bottles of similar sizes in appropriately sized boxes. Get the height of the box as close to the top of your bottles -but not under!- and don’t let a single bottle touch another. Use towels, socks, your crazy collection of used wine corks (I did this! ), anything that is soft to help secure each bottle in it’s place. Shake that box hard to make sure you don’t hear movement, if you do – add more packing materials. If the top of the bottles don’t come up to the top of the box when closed, fill in the top with folded towels or something light but strong. These boxes will get stacked on top of each other and any space left in the top will cause that box to dent when under pressure, causing all of the boxes on top of that one to tilt, or worse, fall. Fall in love with your Sharpie marker. You’ll be making lots of “Up” arrow drawings, writing “FRAGILE” and “HEAVY” and “LIVING ROOM” all over these boxes. But it’s okay – you’ll get through it! Pour yourself a quick dram and let the drawing begin! I hope you find these tips helpful. If you are embarking on a journey that requires you to go through the above – or similar- steps, then I wish you all the luck and patience. If I have left anything out – I’ll be sure to reply/comment/update as necessary. 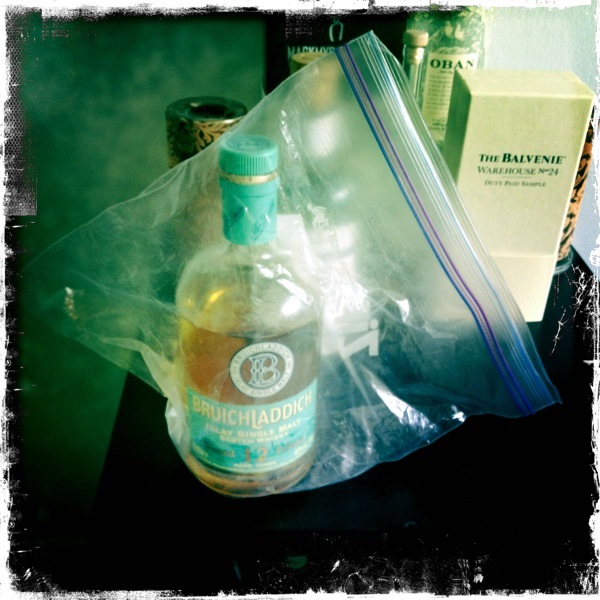 Here is a photo of my 750ml, 9 1/4″ tall bottle of Bruichladdich in a 1 gallon size Ziploc baggie. I like to pull the baggie over the bottle hard enough that it creates a bit of pressure and holds that cork (or screw cap) securely in place. Here is a photo of my 750ml bottle, 12″ tall bottle of Tom Lawless that is too tall for the 1 gallon size Ziploc but a perfect candidate for the 2 gallon size. If you can’t close the zipper bag without it tearing – the baggie is too small for that bottle. Please share your own thoughts/experiences/questions/ideas below. I definitely do not have all of the answers – nor can I or this blog take any responsibilities for your brown beauties should something happen to them during your own move. I just hope you can find some of these tips useful! Great tips for moving! Hey – what the heck is Tom Lawless? I’ve never heard of that one. Tasting notes? 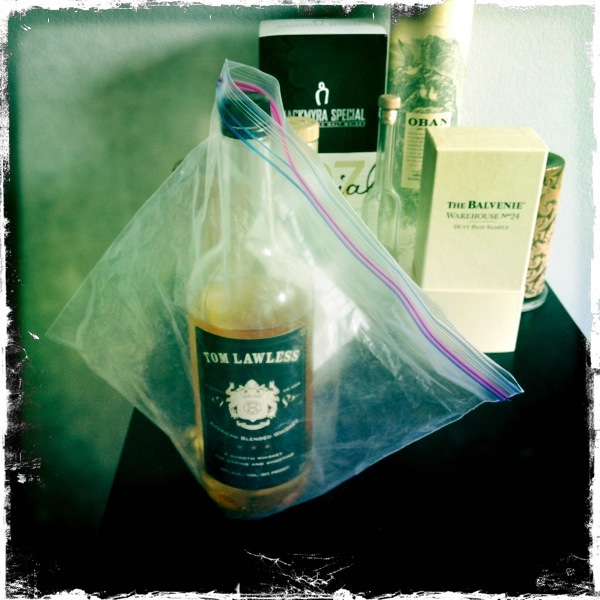 Tom Lawless is a blend that is privately labeled by The Whiskey Shop in Brooklyn. They only sell it out of their store – which you should totally check out! Tell Jonathan I sent you. There is a whisky bar right next to the shop by the same owners. I should definitely do a post w/tasting notes… great idea! I’ll have to bookmark this post. While it’s (hopefully) going to be a while before I have to move, figuring out how to deal with all of my spirits definitely weighs on my mind a bit. That and books. They’re all trouble. Ha! Oh those books … & don’t forget the glassware! I went through more stacks of the NY Times wrapping all of my stemware than my local coffee shop sells in a regular weekend. Thanks for coming by and commenting! It’s nice to learn about your blog – I am terrible at creating cocktails but have always wanted to increase my lack-of-skill. I need to study your posts! You are currently reading HOW TO: Move a whiskey collection at The Whisky Woman.